Welcome to Internet Family Fun! Why pay for calendars and agendas? Download and print yours! When is that holiday? A handy page to bookmark to find out when they are. Send free eCards for any occasion. See free Printable Greeting Cards and Invitations. Tons of Sudukos that you can either print out and take with you or you play the suduko online. Either way, it is fun to suduko! Don't post about Farmville, Mafia Wars, Petville, etc to people that don't play. It is easy to send posts to people that play and not bother people that don't. Here is how. Don't start a family feud with an email! Read these guidelines before you forward. Have you ever wondered how to type the copyright symbol (©) when it isn't on your keyboard? It's easy to type these and a lot of other characters. Here's how. Don't spend money on information. You can get telephone numbers online for free and you can get free directory assistance on your cell phone with a free 800 number. How about a game against the computer? Play for free here. Internet safety is very important because there are predators out there looking for your children. When they are online and don't know the rules and they don't know that they can talk to you, they are easy pickings for predators. Sit down with your kids and agree to family rules for computer use. Start with or use this Family Computer User Agreement. Need a calendar? Get the kind you want! Printable monthly calendars and year-at-a-glance are available to download for free. Make some homemade playing dough, bubbles or something fun to eat like cookies. Find out about your doctor's credentials online. Here are the common mistakes that families make online. Learn what they are so you can avoid them. Print out this handy list of kitchen equivalent measurements to keep on the inside of the door to your cabinet. If you use other people's computer, you can't install your favorite programs. With a portable USB flash drive, you can use portable applications that will run on the computer without installing them. Here is what you need to know about portable applications and flash drives. Do you remember the hours of fun in a darkened room with a flashlight? Your kids can have the same fun you had. Here are tons of different hand shadows you can make. Runescape is a fun, free game but is it right for your kids? Find out all about Runescape. What type of filtering or monitoring software is right for your family? Only you can answer this and here is help. The consequences can be severe if you don't secure your home computer. Find out what bad can happen and how to secure your computer. Need to convert measurements? Determine loan payments? Here are some great free calculators. Identity theft is at an all-time high. Do you know how to protect your identity? Here are some steps to protect yourself. Have you ever wondered who owns a Website? You can easily find out with these directions. Is World of Warcraft appropriate for your child? Here is what the game is about and help to decide. A collection of great sites arranged by topic, for families and kids to enjoy. States are holding billions in unclaimed money. Find out if any belongs to you for free! I know this sounds silly because every one is trying to stop them but sometimes you need to allow pop ups. Here is how to allow the ones that you want. Many computer users don't realize that they can drag and drop files. Once you learn how you will be amazed how quick and easy file organization can be. I would love to buy a new computer because mine is getting so slow, but I can't. I set out to speed up my computer and it worked and it was easy. Here are some tips to speed up your computer. New images are being processed for you to enjoy for desktop wallpaper. Installation is simple and you can enjoy a scenic view on your desktop. Print out each month to keep your family organized. Calendars include holidays. Print out free birthday party invitations. New: a birthday pool party invitation. Print out this free printable bingo party game for up to 25 players. It is even big enough for the classroom and it is fun for the kids to play. You can save so much time by using keyboard shortcuts! You don't need to learn them all but some are so invaluable, that you really shouldn't be living without them. For instance, while typing a document, you don't need to go to the file menu to save - just hit CTRL + S.
If you don't know how to copy and paste, now is the time to learn. You will save a lot of time! If you do know how to copy and paste be sure to read Advanced Copy and Paste Techiques. You will be surprised what you can do. Listen to music while online or download great free music. Why are you paying big bucks to be online when you can pay less or even get online for free! Professionally created images for your desktop. 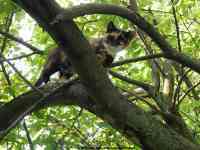 The collection includes this cute kitten looking down from a tree branch. More images coming soon. Ready for some fun with puzzles and games? How about an online jig saw puzzle? Or a printable crossword puzzle for the kids? You can keep them busy for hours online and off. The added bonus - there is no violence in these games. Enjoy these free printable greeting cards for many occasions including thank you cards, birthday cards and more. Also I added graduation party invitations. More to follow!